Lefkada (Greek: Λευκάδα; or sometimes Lefkas from ancient Greek: Λευκάς) is a very beautiful Greek island in the Ionian Sea, connected to mainland Greece through a long causeway and a vessel that serves as a floating bridge. This bridge slightly rotates every hour to allow boats to pass through the narrow straits. Lefkada is the fourth largest of the Heptanese islands (Ionian Islands) in terms of area, as well as in terms of population, which reached 22,652 inhabitants in 2011. The main characteristic of Lefkada is the fact that it is a particularly green island with pine trees growing everywhere and almost until the sea, as well as the stunning beaches and emerald-blue sea. Several little jewels, verdant uninhabited islets, are located on the east of Lefkada (near the village of Nydri) and most of them can be visited by boat from Lefkada. These islets offer magnificent beaches and caves, which are definitely worth seeing. Owing to the earthquakes, which were common in the region in the past, many of the houses in the city of Lefkada were constructed using zinc panels and wood, which give them this particular style and look. The beach of Porto Katsiki is considered as one of the ten most beautiful beaches in Greece and it is a stunning combination of a pine-tree covered cliff with golden sand and emerald sea. Apart from the magnificent beach of Porto Katsiki, Lefkada has several wonderful beaches, such as Mylos, Vasiliki, Kathisma, Egkremnoi, Gialos, Kalamitsi, Pefkoulia, Ammousso, Mikros Gialos, Agiofylli (accessed by boat from the beach of Vasiliki), Ai Giannis/Myloi, Ammoglossa and Kastro/Gyra. Karya is a picturesque and traditional village in the heart of Lefkada. From the village of Karya, traditionally comes the Karsaniko embroidery, made with three to four fragments of silk thread at a time and it has the particularity of looking exactly the same from both sides. Karsaniko embroidery was used for the decoration of the traditional clothes of Lefkada. Egklouvi, built on hills, is the highest village in Lefkada (elevation: approximately 730 metres). The village is well known for producing probably the tastiest lentils in Greece. Around the village, one can see the dome-shaped stone buildings, known as Voltoi, where farmers used to stay while working in the fields. Archaeologists believe that these buildings have existed since the Homeric era. The gorge of Dafni, near the village of Karya, with its long-lived Plane trees. Cape Lefkata is the southernmost spot of the island of Lefkada. 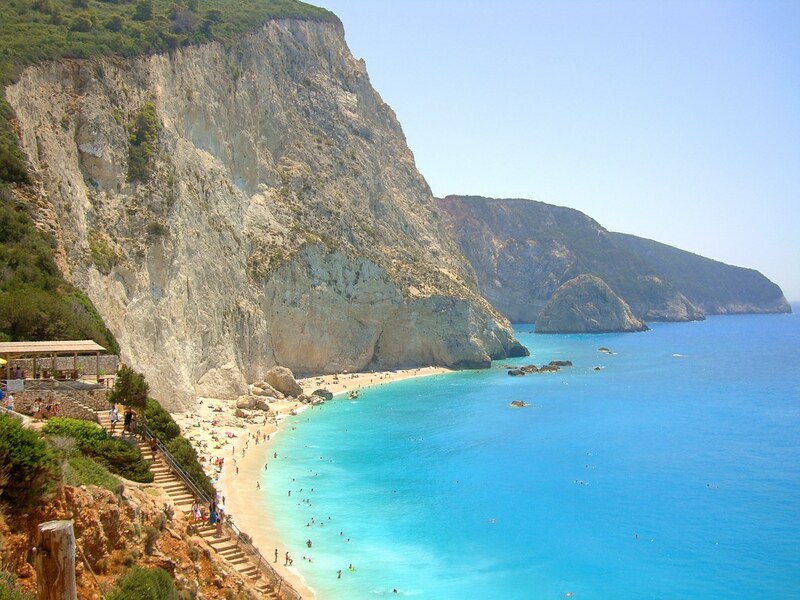 The island’s name comes from the white (Greek: λευκά, pronounced “lefká”) cliffs found near the Cape Lefkata. The lighthouse stands on a majestic 60 metres high cliff. The 20-metres high waterfall and its surrounding scenery found in the gorge of the River Dimosaris, near the village of Nydri. This “hidden” region, also known as Ronies, is particularly beautiful regardless of the season. Near the village of Nydri, one can see o complex of tiny and evergreen islets, which creates a scenery that is absolutely breathtaking. The largest among them, Meganisi, is inhabited and it is connected to Lefkada by ferry boat on a daily basis. A very important lagoon, in terms of ecology, is formed between the main city of Lefkada and mainland Greece. This habitat hosts many species, and it is an important intermediate stop to the flyway of migratory birds towards the south, e.g. for flamingos. The Fortress of Aghia Mavra was built in the beginning of the fourteenth century by order of Ioannis Komnenos Doukas (English: John II Orsini, Italian: Giovanni II Orsini) count palatine of Kefalonia and despot of Epirus. The fortress protected Lefkada against pirates and other enemies from the first decade of the fourteenth century until 1684. The ancient city of Lefkada, called Nirikos, which is found two kilometres east of the modern city of Lefkada. The Archaeological Museum in the city of Lefkada, which features specimens from the Palaeolithic era until the Roman period. The Art Exhibition Centre dedicated to the great expressionist painter from Lefkada, Theodoros Stamos. The centre hosts various art exhibitions, such as painting, sculpture, comics, photography etc. The Phonograph Museum in the city of Lefkada, established in 1980, hosts a large collection of phonographs, gramophones, barrel organs etc. The Folkloric Museum “Pantazis Kontomichis” of the Musical-Philological Club “Orpheus” has been awarded by the Academy of Athens for its cultural impact. Established in 1978, this folkloric museum hosts more than 1,000 representative specimens of the culture, tradition and history of Lefkada. In the village of Karya one can visit the Folkloric Museum “Maria Koutsochero” dedicated to the particular local embroidery “Karsaniko”. The International Folkloric Festival of Lefkada, which takes place in the city, during the last week of August. The Lentil Fest is an event to celebrate the lentil produce of the village of Egklouvi. It takes place each year on the 7th of August, at the chapel of Aghios Donatos. On the first weekend of August, a representation of the village-style wedding takes place in Karya, with traditional songs, dresses and food. There are dozens of activities that one can engage into, while in Lefkada, such as swimming, hiking, mountain biking, paragliding, wind-surfing, kite-surfing, wakeboarding and scuba diving. Salami Lefkados is the traditional and delicious air-dried salami, unique specialty of Lefkada, prepared with pork meat and fat, as well as garlic and peppercorns. Sofigado, meat, onion, garlic, quince, vinegar and petimezi, a sweet viscous product, made by reducing and caramelising the grape must (grape juice) over low heat for very long time. Maridopita is a dish made with fresh fish, fresh tomatoes, onion, garlic and cheese. Savoro, a dish prepared with fish, olive oil, vinegar, garlic, raisins and herbs. Tmats is a type of pasta, traditional of Lefkada, made with flour and water and given a particular shape resembling the Italian tagliatelle. Tmats is boiled in water (or broth) mixed with fresh tomato juice and olive oil and served as a pasta stew. Rizopita, which translates to “rice pie”, is a typical sweet of Lefkada made with rice, milk and eggs. Ladopita, literally translating to olive-oil pie, is a traditional sweet of Lefkada made with flour, olive oil, sugar, and water and topped with sesame and ground cinnamon. This sweet was prepared and consumed during special occasions, such as New Year’s Day, weddings and baptisms. Pandespani is a sweet made with semolina, sugar and eggs and it is also a traditional sweet of Karya. The traditional mandolato sweet is a type of nougat found in the Ionian Islands and prepared with almonds, egg whites, sugar, honey and vanilla. Local excellent products include wine, figs, walnuts, almonds, olive oil, honey and special cultivars of grapes, such as the rare variety vertzami. Also, the lentils from the village of Egklouvi are considered as the tastiest in Greece. Lefkada is also known for its sweet peas (alternative name: vetchling; scientific name: Lathyrus clymenum), chickpeas and peas. The blue markers shows the location of various accommodations in Lefkada. The letter in the marker describes the accommodation types: H for Hotel, A for Apartment, R for Resort, B for Bed & Breakfast and O for Other (e.g. pension, villa). Click on the blue marker for more information on the accommodation.